The Best way to Frost Cupcakes-- use a Ziploc bag to make a piping bag! You are here: Home / Cakes / How to Frost Cupcakes with a Ziploc Bag! How to Frost Cupcakes with a Ziploc Bag! You don’t need fancy icing pastry bags to make pretty cupcakes. 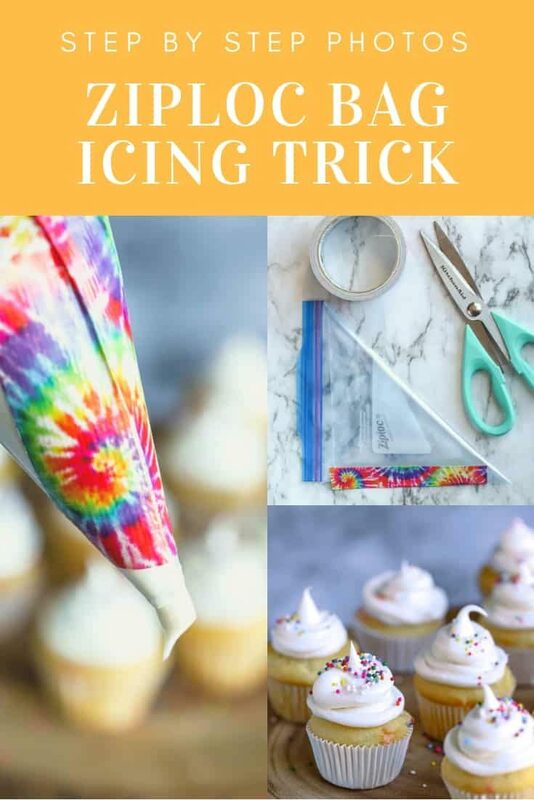 Frosting your cupcake with a homemade piping bag can be accomplished with materials you already have in your kitchen– a Ziploc bag and Duck tape! Get ready to find your inner pastry chef and create beautiful iced desserts with this simple Ziploc icing bag trick. I first shared this post showing the Ziploc bag icing trick in 2012 and it has been one of my most popular posts because it is the easiest way to frost cupcakes. Who doesn’t love a kitchen shortcut! Materials as basic as a Ziploc bag and duck tape turn will transform how you decorate cupcakes and cakes. Even if you usually use pastry bags for icing baked goods, you’ll turn to this trick on the odd day when your supplies run out. I know I have done just that! 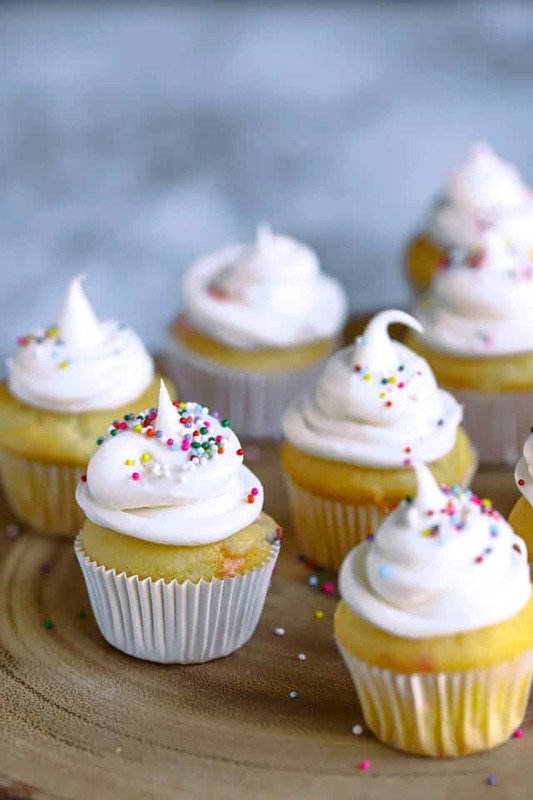 Let’s learn how to ice cupcakes without a piping bag. Ziploc to the rescue! 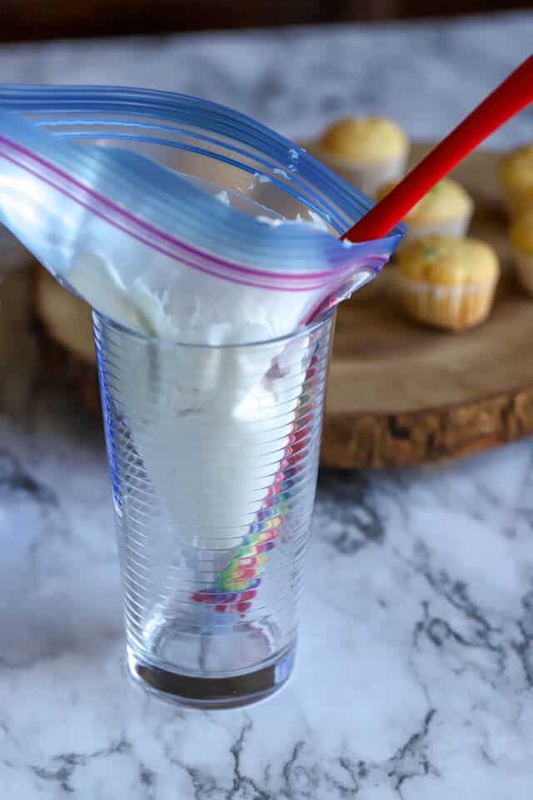 How do you make a frosting bag out of Ziploc? 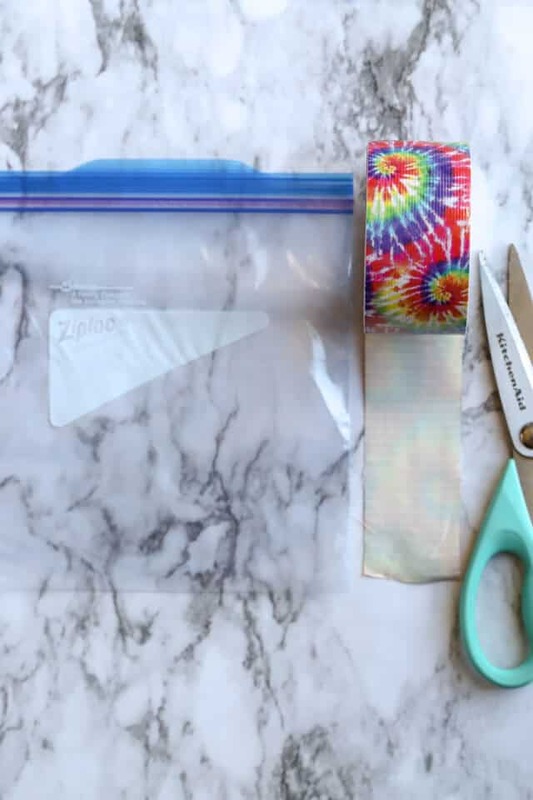 Fold the square Ziploc bag into a triangle. Secure the edge with duct tape. Fill the piping bag with frosting. Cut the corner and pipe the frosting onto a cupcake. 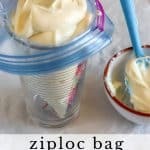 What is the best type of Ziploc bag for a Piping Bag? My first few times using this kitchen hack turned out well and so I’ve refined the process along the way. Freezer Ziploc bags work better than sandwich bags. And this is not a promotion for Ziploc, but honestly, Ziploc bags work far better than their generic counterparts. Duck tape (or any brand of duct tape) works better than the stapling technique I first implemented. Scotch tape or packing tape work less so, but in a pinch, use what you’ve got! 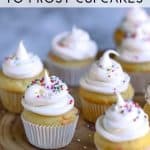 What is the easiest way to frost cupcakes with a Ziploc bag? The cake decorating aisle at craft stores can be intimidating. There are so many gadgets that appear to be necessary to pull off a bakery-worthy cupcake. 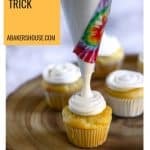 Which icing tip to use? How do you use those icing bags? Should I get washable decorating bags or disposable? Will my cupcakes really look like the ones in the picture? Do I need a baking class just to ice cupcakes? The list of wonders and frustrations go on. Simplify and use this Ziploc icing bag trick. When can I use the Ziploc bag icing trick? Obviously I use this trick for frosting cupcakes and cakes all of the time. The short cut is also a time saver (and a mess saver!) when it comes to making no bake cheesecake bites. Start with Ziploc bags and duck tape. Scissors will be necessary too. Fold the Ziploc squares into triangles. You’d be surprised at the difference in ease of icing that this change makes. Secure the edge with duck tape and you are ready to go. Filling any type of icing bag– Ziploc or pastry– can be a messy process. Make it easier on yourself by placing the icing bag in a tall glass. Open the bag as wide as possible and use a spatula to fill the bag with icing. Trying to hold the icing bag in one hand while wrestling with the spatula in the other simply doesn’t work for most of us! A glass frees up your hand and provides a steady place for the icing bag to rest. Once the Ziploc icing bag is filled, push any excess air out and seal the top. 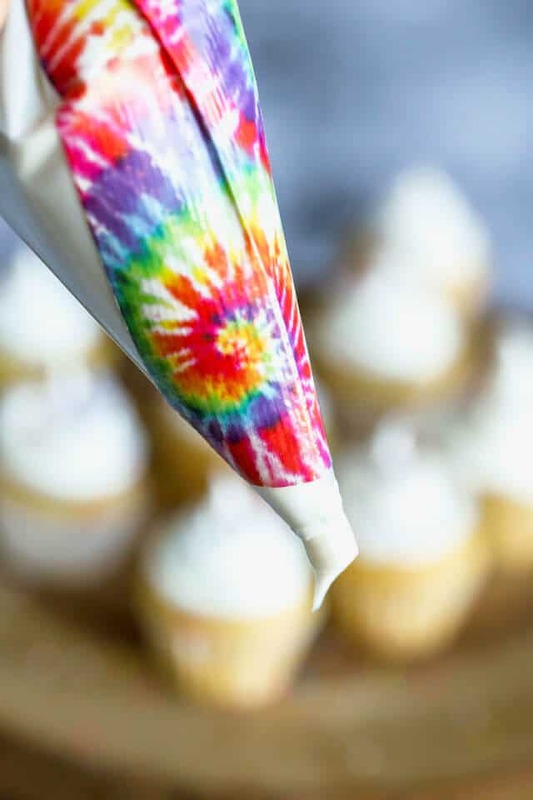 Cut the tip of the icing bag with scissors and you’re ready to decorate those cupcakes! Let’s move on to how to use an icing bag. Making a pastry bag is only half the task– using it to frost cupcakes is easy! This icing bag will fill in for a purchased decorating bag in a pinch or all of the time if you find the method an easy one. 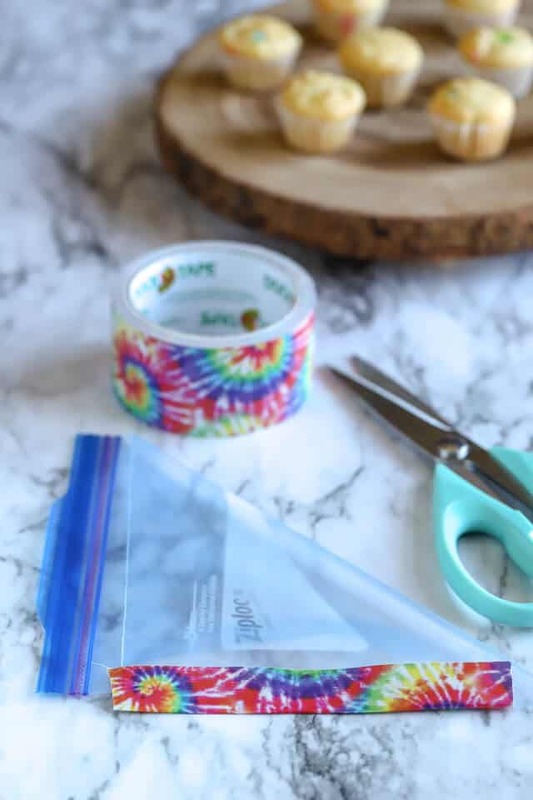 You can either cut a hole in the bag and decorate as is –without the metal icing tips– or go ahead and add the tips the same way you would with a regular icing bag. 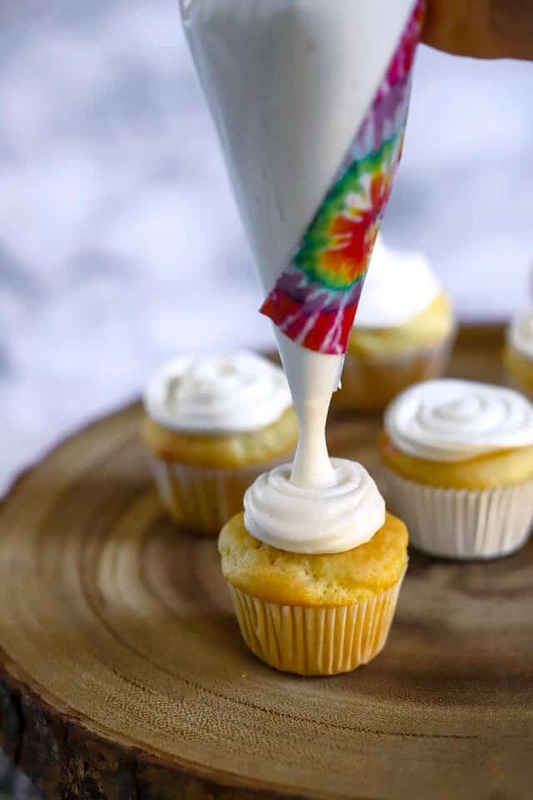 Let’s Jazz up that Store Bought Frosting! 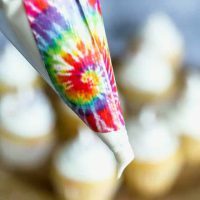 There’s no shame in using frosting straight out of the can– I’ve been known to eat it by the spoonful– but if you are looking for ways to dress up your store bought icing, you’ll find just what you need in this list of ideas. Grab the instant download by joining my email list using this sign up form. Decorating techniques are the same with this Ziploc Icing Bag Trick as they would be with a pastry bag. Try decorating in a swirl from inside out like the cupcakes in the background of the above photo. Another suggestion is to hold the bag upright and squeeze with equal pressure so that the icing covers the surface of the cupcake. Pulling the bag straight up and releasing the pressure will create that bakery-like finish with a point of icing on top. Looking for more cupcake ideas? Try these! Please note that this post was originally published in March, 2012, and updated in September, 2018. Select the right decorating tip for your needs. Use a round tip to make dots and lines, and for writing messages. This just helped me out a lot! THanks! that is great! Thanks for letting me know! I bet your cupcakes were beautiful. Great idea Holly! I do use a zip lock but never thought about the tape! Surely this will improve my skills! Now, this is really clever! I’m definitely not proficient at decorating desserts with frosting but this could definitely help me out. I am all about making things in the kitchen easier. This is fun to use with kids too– easy to make the bags and fun to magically turn the kids into pastry chefs! What a great buy you made! 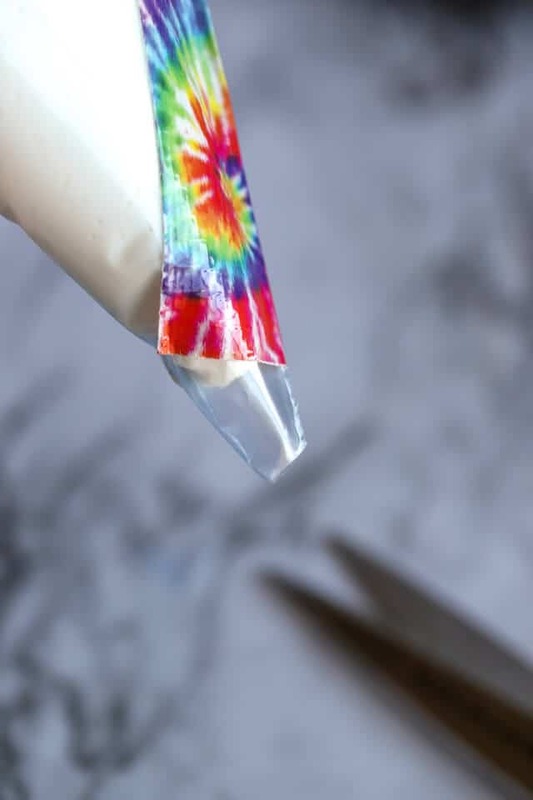 This trick will come in handy when your supplies run low. We never have real icing bags, so we always do it this way. It’s so easy. Such a genius idea! The tape is going to really help me. I haven’ tried that before! Thanks! Simple hacks in the kitchen make life much easier. I don’t do a whole lot of baking, so I use Ziploc bags when I need to. You are right about Ziploc being the best for this. I’ve had quite a few cheap bags burst at the seams and make a big mess. I learned some new tricks from you, though! Can’t wait to try them next time I need to decorate a cupcake! This method makes it SO MUCH easier to pipe! Yes, it takes the mystery out of the pastry bag icing technique– it’s a plastic bag, not hard at all! What a creative idea. I love the use of the colored duct tape. Might be able to get the Grand kids to help using that. Thanks! This is fun with kids too because clean up is a cinch. Simply toss the bag when you are finished. No messy clean up. What a great tutorial! I always love hacks like this that make baking and kitchen work easier. I’ve never thought about using tape. I usually just cut the corner, but the tape makes it much more easier. Thanks for sharing this trick and the decorating techniques too. I’m trying this next time. You are right– the tape gives you a better angle to hold and the icing doesn’t get caught in the corners the way it does if you only use it as a square. What a great trick and great tips. Definitely trying this next time I pipe icing. Thanks! It’s really simple which is always the best.